A journey exploring the hidden corners of Asia, Africa and South America. 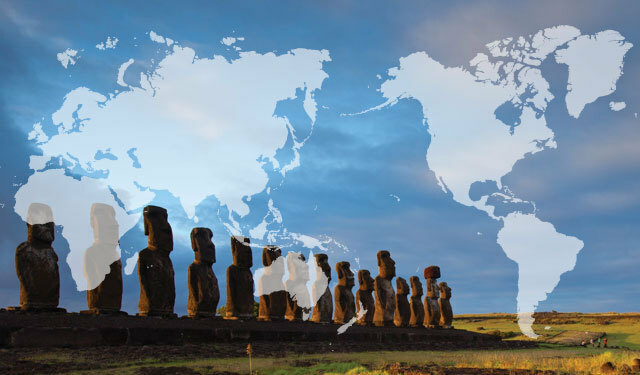 Discover eight legendary destinations that have captured the imaginations of human- kind, including 10 UNESCO World Heritage sites. Immerse yourself in Kyoto’s tranquil Zen gardens and Buddhist temples. Gaze in wonder at the Pyramids of Giza and marvel at Isfahan’s blue-tiled mosques. Encounter the incredible biodiversity of the Galapagos Islands on a three-night cruise. Embrace the vibrant spirit of Rio de Janeiro, the romance of Casablanca and the incredible cultural fusion of Hoi An in central Vietnam. An extraordinary journey across Europe, Central Asia and the Middle East. Leave the beaten path behind on this extraordinary journey across Europe, Central Asia and the Middle East. Discover nine emerging destinations where storied pasts mingle with intriguing futures. Bask in the shadows of lost empires in the Silk Road oasis of Merv, Turkmenistan, which connected Europe and Africa to the Far East, and marvel at the Persian-Islamic architecture in the Iranian city of Isfahan. Explore Spain’s Basque heritage, experience the Douro Valley’s acclaimed wine culture and discover the hidden gems of Eastern Europe. A journey of eternal summer aboard our private jet and the luxurious Golden Eagle Trans-Siberian Express. Follow the midnight sun to the world’s northernmost reaches. Explore Russia’s wild Kamchatka Peninsula, stay in Mongolia’s dramatic Gobi Desert, and soar over Green- land’s starkly beautiful icefjords and glaciers. Experience the magic of long summer days in Northern Europe’s most vibrant capitals and remote Siberian outposts. This 23-day journey of eternal summer combines the finest private jet experience with four nights aboard the well-appointed Golden Eagle Trans-Siberian Express. Our classic journey offers a life list of iconic destinations in a single itinerary. Our classic private jet journey offers a life list of destinations to some of the world's most iconic places, including Machu Picchu, the Taj Mahal, the Great Barrier Reef and safari in the Serengeti Plain. By combining these destinations into one seamless, elegant trip, we create a 24-day itinerary that is truly an opportunity of a lifetime.